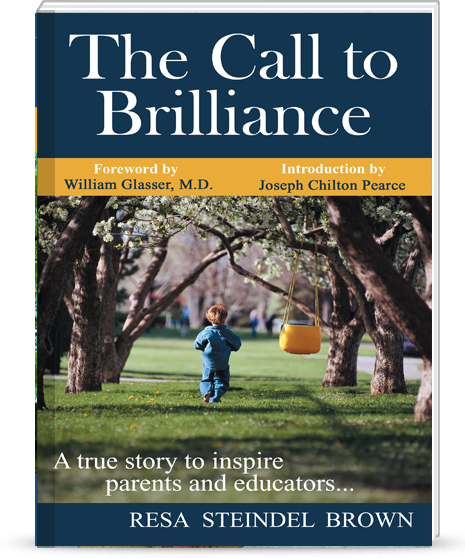 The Call to Brilliance is a true life story to inspire parents and educators. In an engaging memoir, award-winning educator, Resa Steindel Brown is drawn to the astonishing discovery that all children are born brilliant. With insightful commentary, she recalls her own trials as a student and teacher in our industrial, one-size-fits-all educational system. Then she encounters the needs of her young son. Finding a fit is like trying to stuff an odd-shaped child into a square hole. The love for her son propels her on a journey that sweeps her own children, and the children around her, into a learning environment driven by joy, exuberance and passion instead of heartbreak and defeat. Unable to read until ages nine and ten, they entered college at eleven and twelve, became systems administrators, chief technology officers, trained with the Berlin Opera and Hamburg Ballet, created digital images used in the film "Lord of the Rings," presented software solutions to TRW, Pac Bell, Industrial Light & Magic, NSA and more, all before the ages of eighteen. The Call to Brilliance devastates the concepts of learning disabilities, dissolves the artificial barriers of non-developmentally based early grade levels, and unveils the pretense of standardized testing. But above all, it shows us how all children can succeed and find their own passion and special form of brilliance. Resa has consulted with, developed and run private and public schools and programs for the last 40 years. She has strong connections with Montessori education and homeschooled her own three children into college. Her model for education has been recognized by senators, bestselling authors, and top news media, including CBS, ABC, NBC, The Wall Street Journal, The New York Time. The Call to Brilliance is an Amazon.com Best Seller in Parenting & Family, a Mom’s Choice Award recipient and Foreword Magazine’s nomination for book of the year. It is endorsed by legendary bestselling authors and public speakers William Glasser, M.D., internationally renowned psychiatrist and founder of Reality Therapy and Choice Theory, Joseph Chilton Pearce, acclaimed authority on human development and author of The Magical Child and Crack in the Cosmic Egg, John Gatto, author of Dumbing Us Down and The Underground History of Education, Jack Canfield, co-author of Chicken Soup for the Parent’s Soul, Tobin Hart, author of The Secret Spiritual World of Children, and Victoria Kindl-Hodson, co-author of Respectful Parents, Respectful Kids. The foreword is by Willam Glasser and the Introduction is by Joseph Chilton Pearce. "This book is a powerful critique of why many public & private schools don’t work. The author ... offers a wonderfully supported hypothesis about how to fix them." "As soon as I read the first thirty pages, I was not only surprised, I was slightly overwhelmed. I could not put it down. … Here was a book that went considerably beyond what I ever learned especially in the area of home schooling ." "A must read for all parents and educators, including all the students in my graduate education classes . This book tells a story of courage and triumph. It reminds us of what humans are capable of when given the opportunity to follow our unique paths from an early age. It's one of those books when once started, is impossible to put down." 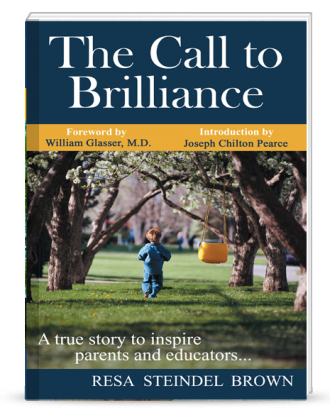 "The Call to Brilliance is a potent memoir as well as an instructive look at what we've done (and do) wrong in our schools…Brilliance, genius and creativity are our children's birthright. Resa shows how these natural capacities can be welcomed and wooed from the inside out. This is a rich, subtle and important corrective to the institutionalized underestimation of student's potential and an antidote to those practices that dull them."